Our flagship product for lenders, brokers and buyers! The LenderCheck Report was developed as a result of focusing 35+ years of environmental consulting experience on a single aspect: ease of use. 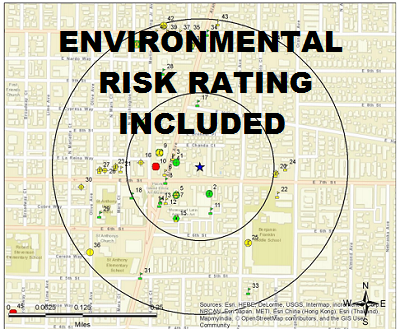 Our LenderCheck Report can be in your hands in under 30 minutes and includes an ENVIRONMENTAL RISK RATING with next step actions designed by our Environmental Professionals. Don’t Get Caught with Unknown Environmental Conditions at Closing! A tool commonly used by lenders, brokers, and buyers for environmental screening of collateral properties, pre-loan due diligence, semi-annual portfolio screening, prelisting, pre-closing, etc. Multiple Risk Ratings (1-5) gives you flexibility in next step actions versus defaulting to an elevated/high risk.